Recently re-installed X1 Search (8.6.1 6003fa -64bit), do not find X1 RTI Plugin in Outlook O365. Are you seeing some sort of prompt that complains about this? Have you looked in Outlook? Did re-install of O365 and X1 as Outlook e-mails were not getting indexed neither OST/ PST. Now the Add-in is available and is selected. 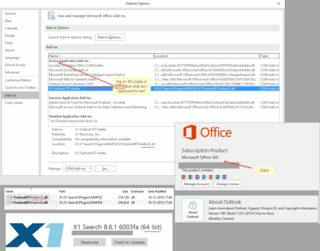 Issue is X1 is not indexing Outlook e-mails, while adding PST X1 throws error. as unable to add PST, restart or contact support. BTW, out of curiosity, what version of X1 did you install and what version of Outlook has been installed, I mean: 32bit of 64bit ? but .. what am I supposed to see within Outlook? Note that I run X1 by just launching it from desktop. The indexing is fine. Searching within Outlook is done by the search function of Outlook, not X1. There is an add in installed (32bit) but X1 is not used within Outlook, that is to say, *I* don't use it. BTW this X1 version, has it been announced somewhere?